It’s the year 2010. It’s the time of cover-based third-person shooters. It’s Sam Gideon, the overly confident protagonist, the calm and collected ladies’ man, the cigarette-smoking lovechild of Sam Fisher and Solid Snake. And it’s in his shoes, those clanking robo-shoes, that you satisfy all your needs...that is, if your needs are mindless arcade violence and hyper-fast gunplay. Vanquish, originally released in 2010 for console and just now making it’s way to PC, plays like a love letter to the golden-era video games of yesteryear. It’s chock full of bullets, lasers, and explosions. You bounce around from cover to cover in a rocket-powered robo-suit. You destroy hordes of enemies with an array of weapons, turrets, and vehicles — and you do it all really, really fast. Set in the near future, a Russian military organization called “the Order of the Russian Star” is at odds with the United States and their president — who looks exactly like Hillary Clinton [EN: Ha]. They’ve managed to take control of a massive space-station that, using the power of the sun, can obliterate entire cities with it’s red-hot space laser — which they use immediately, starting with San Francisco. Following the melting of many people and buildings, the Russians demand that the U.S. surrender to them, otherwise they will blow up the city of New York next. Enter Sam Gideon and his super-powered robotic suit (along with the rest of the United State’s space military) and his mission to take back the space laser from the Russians — thereby saving the entire world. That being said, the story is completely secondary after it’s initial development. Combat is the soul of Vanquish and, if you like combat, there’s a heck of a lot of it. Like any other arcade shooter, it can get repetitive, but it’s unique gameplay mechanics will keep you coming back for more. After it’s lengthy front-end cutscenes, Vanquish becomes non-stop action. While the game could function fine as an average shoot-em-up, it takes things to the next level with the inclusion of Sam’s suit: a P.N.03-reminiscent-acrobatic-thruster-thing (I forgot about that game, too), that allows Sam to travel easily from cover to cover, as well as slide quickly along the ground. On top of that, whilst slidin’ around, you can enter the suit’s Augmented Reaction (AR) mode that allows for some fun slow-motion gunplay and bullet-dodging mayhem. 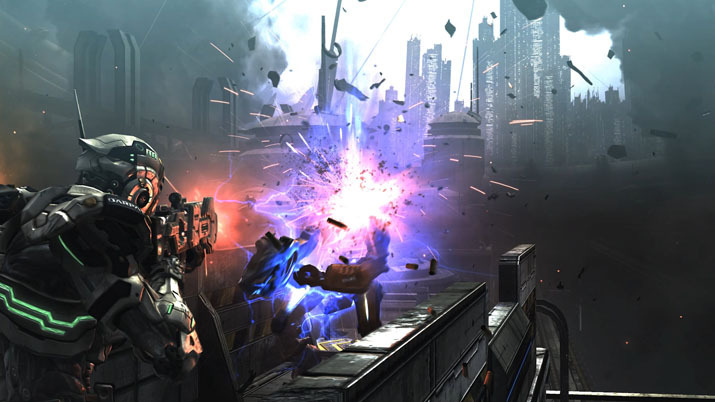 The AR function is when Vanquish is at it’s most fun and is easily the main draw of the game. At most times, the opposition is myriad. Your enemies mostly consist of a bunch of red Russian robots that aren’t afraid to rush you in battle or pick you off from their turrets and vehicles. Most are easily taken care of, a few spurts of your assault rifle should do, but get too close and they’ll quickly melee you — usually resulting in your immediate death. In my first mission, in my first seconds on the battlefield, I made the mistake of rocket sliding straight into a fight — where I was quickly died. My only real gripe with the ordeal is that Vanquish encourages you to push constantly forward, but, get too close, and it’s a quick game-over, even on Normal difficulty. But, even though bullets were constantly raining down on me, I never quite felt like I was in danger. 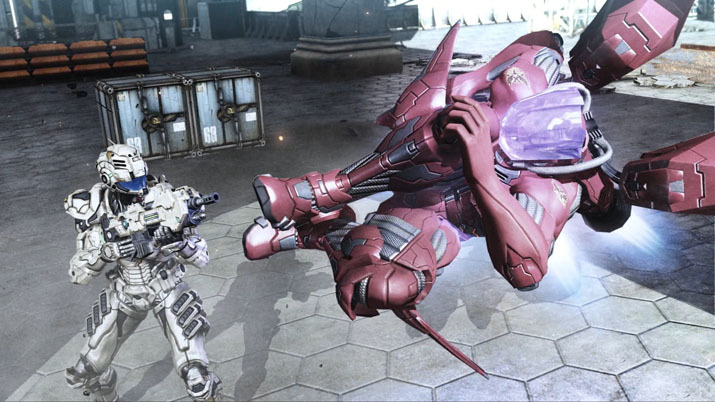 The rhythm of Vanquish feels somewhat easily abused — I would run around and kill some things, take a mess of damage, head to cover to quietly regain my health and stamina, and then repeat. The only times I died were when I headed too far into enemy territory, or I dodged into a corner I was unable to get out of quickly. I briefly played on the hardest difficulty and found the same rhythm to work effectively, just having to spend less time out of cover. I preferred to play on Normal, even though it wasn’t challenging, because I wanted fewer breaks in the action. 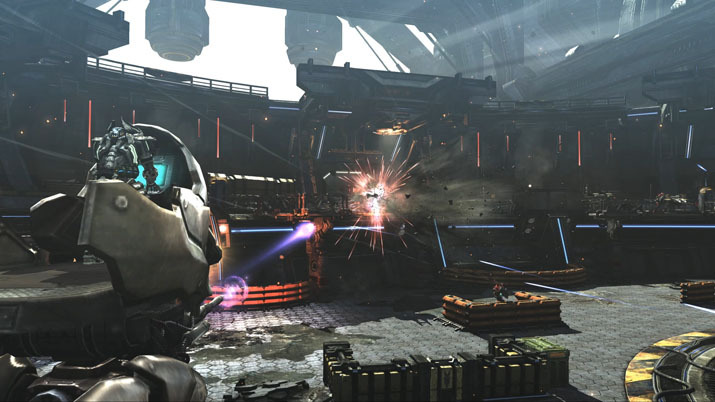 In it’s port to PC, Vanquish has blessed us with an unlocked frame-rate. The game ran consistently high for me with no noticeable hiccups and, in a game that relies on it’s fast paced action, this is paramount. Additionally, the ability to use a mouse and keyboard increases your accuracy and movement capabilities, making the game I imagine, more enjoyable than it’s console counterpart. I can’t imagine that the game looks much better than it did a decade ago. It has some hard edges and spotty textures, but overall it’s easy on the eyes. The cut-scenes are mostly well done and well directed, and I frequently forgot I was playing a game that was ten years old. Vanquish, however, suffers in the audio department. The music is repetitive, forgettable, and ceaselessly thuds along at a high tempo. Even though it’s an “arcade” style shooter, it’s a bit over-stimulating. I found myself annoyed whenever the game was paused and the music kept screaming from the battlefield. The voice acting, unfortunately, is very 2007. Most characters are blown out of proportion, their lines terrible and unfunny, and lucky for us are few and far between. Sam Gideon, the lead, is the most headacheinducing of all, sounding like the amalgamation of every action lead from it’s day played through a standard cool-guy filter. At first it’s all very laughable, but my will to not skip cutscenes weakened with every completed mission. In one cutscene I experienced a bug where the characters dialogue was inaudible under the thundering sound effects of bullets and explosions (which was somewhat welcome at that point), but otherwise the game ran smooth as peanut butter. The fighting never stopped, the game chugged mindlessly forward, and I expertly circumvented my enemies without ever being taken out of the action. Like Sam’s cigarettes, the game’s action is habitual. It never promises anything more than seemingly endless gun battles, it never suggests a different strategy for your enemies, it never discourages you from the rinse, wash, repeat of shooting and cover. It’s sprinkled in boss battles never felt too different from the hundreds of enemies before them, it’s ten or so weapons never felt too different from each other, and it’s point counter in the top right never seemed like it mattered much. However, what it does promise is shooting. A whole lot of shooting. And sometimes, for a couple hours on a Tuesday night, that’s all you need in a game.